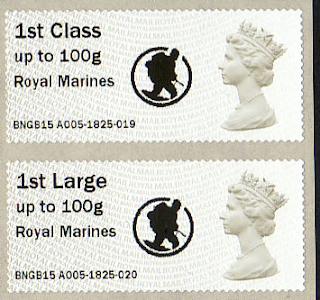 I suppose it is inevitable that as most of this year's Machin definitives have been issued or discovered, that Post and Go and postmark slogans will predominate in the news arena. So,just as it is with the magazines, so it is here and we have some more Post and Go news. On Monday the new 4-design Fur and Feathers stamps were issued. As an innovation the 2nd class stamps have '2nd class' incorporated into the background inscription to ensure that Post Office branch staff put them in the correct part of the machine. Well, that only works if the branches get both 1st and 2nd rolls supplied. 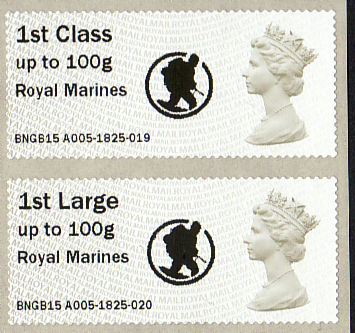 Apparently at least one branch was supplied with only 2nd class rolls, so they put them in both slots, and produced the 'first' range on 2nd class stock. Examples have also been seen from another branch but I don't know whether this was due to no 1st class stock or branch error. I understand that quite a few collectors/dealers were aware of this and there are several listings on the eBay auction site. Responding to the comment about white lines on these stamps, Doug has helped by sending this picture - and there was I, looking for a white line in the background printing, which would have been unusual, on both sets of stamps. This is not uncommon on Post and Go Stamps from the public machines, but it is unusual to see what amounts to poor quality on the packs produced at the Bureau. 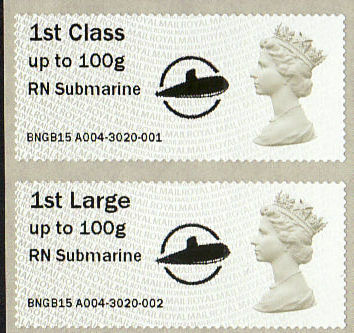 Meanwhile it was all change again at the Naval Museums, with the Machin stamps again being on sale, and so now showing their logos as well as the text identity. Thanks to Chris for these pictures examples of the three Portsmouth Museums. I must admit these are quite distinctive and they will look good in collections. Thanks to Robert for the FAAM image which completes the set. 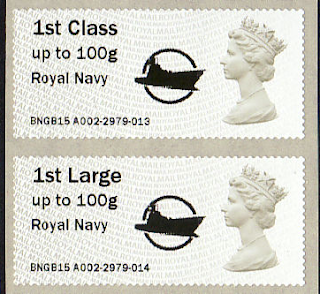 At least two branches received mislabelled boxes, so put the rolls in the wrong printers, and it wasn’t Walthamstow Central. Up to now all Fur and feather packs I have seen have white vertical lines running through both 1st and 2nd class strips,anyone seen packs without these lines?. Mine are all without such a line. It would be helpful to see a picture. Send me a scan to the address at the top of the page? 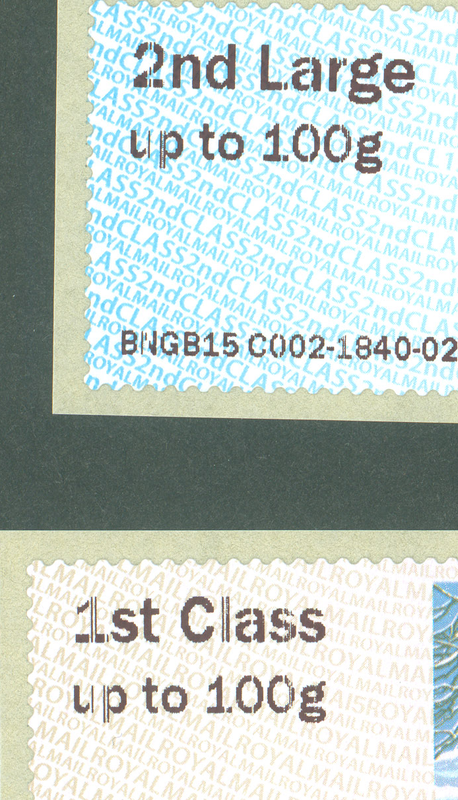 A picture has now been provided which shows that the lines referred to are in the black overprinting, not in the coloured printing on the stamps. Not unusual on live SSKs and exhibition machines but less common on Bureau packs, I think. I'm thinking that the variables on the bureau packs might be applied by inkjet, rather than gravure. If so, this would be a first, wouldn't it? It would explain the second rate quality of printing if that was the case. Variables on bureau packs are now printed by the same method as on public machines, which does explain the quality of printing. Gravure is no longer used. Islington’s faux pas has been corrected. Walthamstow is running short of the 2nd class designs. It looks a bit like the Fleet Air Arm are trying to fly a plane into the Queen's mouth there. Not a fantastic bit of design! According to the IAR website, A006 has a new home, no details of where yet, however a clue may be that it was posted under RAF museum. It has now been changed to Uncategorised but I would suggest the secrets out. Assuming it wasn’t a red herring, it only remains too see which of the two locations (Hendon or Cosford) will get it. I haven't been to Hendon but Cosford has free parking for 20 minutes - so fine if it is not a first day! But it's a FREE museum well worth visiting, and difficult to 'do' properly in a day.